Where services are displayed in the system. Steps to add a new service. How to add service details (title, category, description, etc.). How to add service cost (by time, per job, per unit). How to add rates to a service. How to add different prices to a service for different zones. How to add discounts to a service. How to add custom fields to a service. You can see all your services in services page which is listed under Settings>Services Settings>Services. 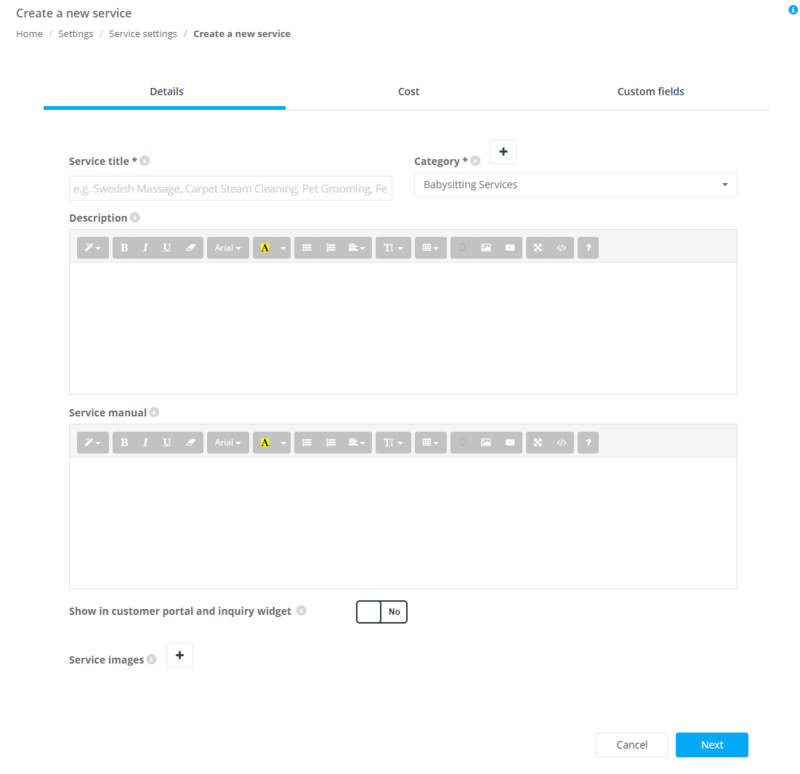 This page shows you a list of all your services with the custom fields of these services, the category in which these services are available, the services minimum price, the visibility of a service (whether you want it visible to customers to be able to book it or only visible to the admin), and the active status for a service (whether this service is active or not used anymore). 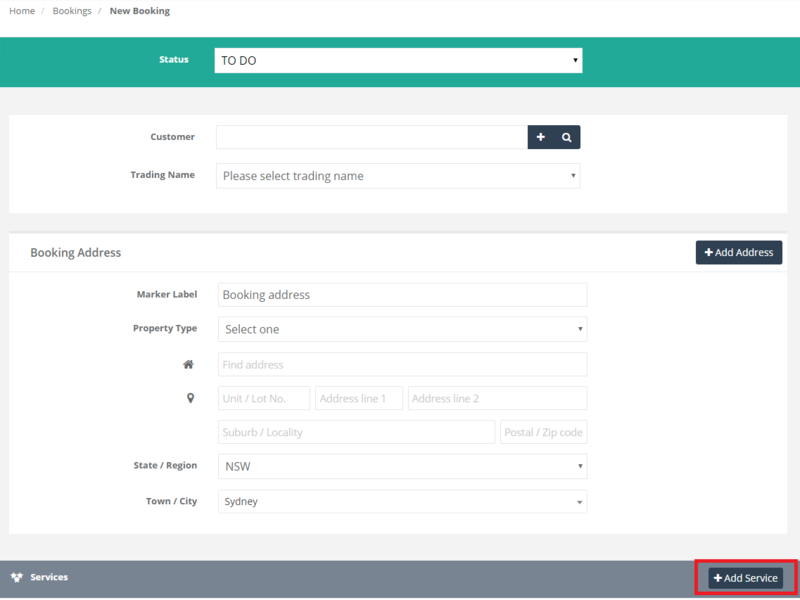 Your services list are displayed to the user to choose from when making a new booking, inquiry, or estimate; or when your customers make new bookings from the customer portal. This screen shot is when making a new booking. When pressing Add Service, all services will appear to the user to choose from, as the next screen shot shows. This screen shot shows services list in the customer portal. The fields that are attached with * are required. Putting the cursor on a field name will show a description about this field. You cannot move to the next tab unless you finish the previous one. This is only if you are creating a new service, but if you are editing it, you can move between the tabs easily. 6. 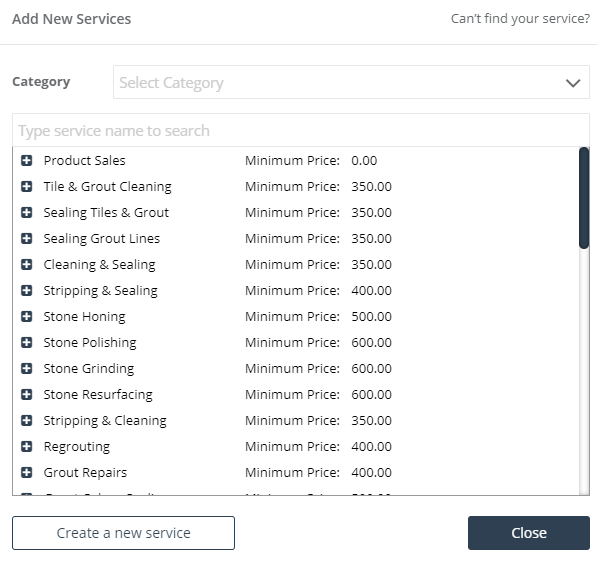 In Details tab, you have to fill in the service name and category. These two fields are required and you cannot save your service without them. You can add a description about your service in Description. This description will be shown for your customers in your Customer Portal or the Branded App. You can also write some specific instructions about this service for your fieldworkers in Service manual. Service manual is only visible for your fieldworkers in the fieldworker App. So first, write the service name in Service title. Then choose a Category to assign this service under. If this new service is not under any of your available categories, you can add a new category by pressing “+” button to assign this service under. Then, you can decide whether you want this service to be shown for customers in customer portal by pressing Yes or No. 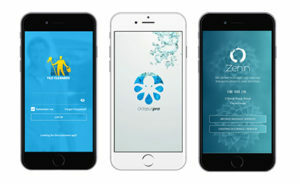 And finally, you can add images about your service; and these images will appear for your customers in customer portal. 7. Click Next. By clicking next, a popup question will appear for you to answer: “Do you want to add this service to all fieldworkers profiles?”. You can answer with yes if you want to assign this service to all your fieldworkers or no if you don’t. 8. In Cost tab, you have to fill in details about Cost (per time, per job, or per unit), Rates, Service location, Discounts, and Fieldworker Payrates. You have to decide how do you want to charge for your service: by time, per job, or per unit. If you choose by time, then you have to fill in three main fields. The first field is Default value. You can set the default value as 1. If you choose the Duration field to be hourly, then the 1 in the default value will mean 1 hour. If you choose daily, then the 1 will mean 1 day,etc. The second field is Standard rate. It is the cost of the one hour or the one day. The third field is Duration. You can choose one of the values: (15 minutes, 30 minutes, hourly, daily, weekly, fortnightly, monthly). For example, if the default value is 1, the standard cost is 100$ and the duration is hourly. This means that the 1 hour costs 100$; and the 2 hours cost 200$,etc. Then you have to add the Minimum booking price. Minimum booking price is the amount you charge for even the smallest job booked. When applied the customer will be charged this amount even if the total value of his actual work required is lower than the minimum booking amount ,e.g., if you charge 30$ per room but the minimum booking you would do is 90$ in the minimum cost field, so whether the customer books 1,2, or 3 rooms, the charge will still be 90$ as that is the minimum booking fee set for this service. 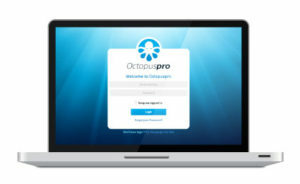 When making a new booking, you can decide whether to apply the minimum booking price or not. If you choose per job, it means the cost of the whole service. Here, you only have to put the price of your service in What is the starting cost of this service?. And the time that takes to complete this service in How much time does it take on average to complete this standard service?. The time of the service appear in making new bookings. When making a new booking , you have to fill in the start date and time of the first visit, then the system will estimate the finish time according to the service duration that you enter when answering the previous question. Then you have to add the Minimum booking price. If you chose per unit, four main fields have to be entered. The first field is Unit. The unit means the unit in meter, liter, room etc. The second field is Unit label. The unit label is a text description of what to be written in the Unit field. These titles will be shown for your customers in customer portal. The third field is Default value. You can set the default value as 1. It means one unit (meter, liter, room,etc). The fourth field is Set standard unit cost. It is the cost of the one unit. Then 2 questions have to be answered: How much time does it take on average to complete each standard unit for this service? , and How much time does it take on average to prepare for starting this service upon arrival? Answering these questions help in estimating the finish time of the first visit when making new bookings. Then you have to add the Minimum booking price. 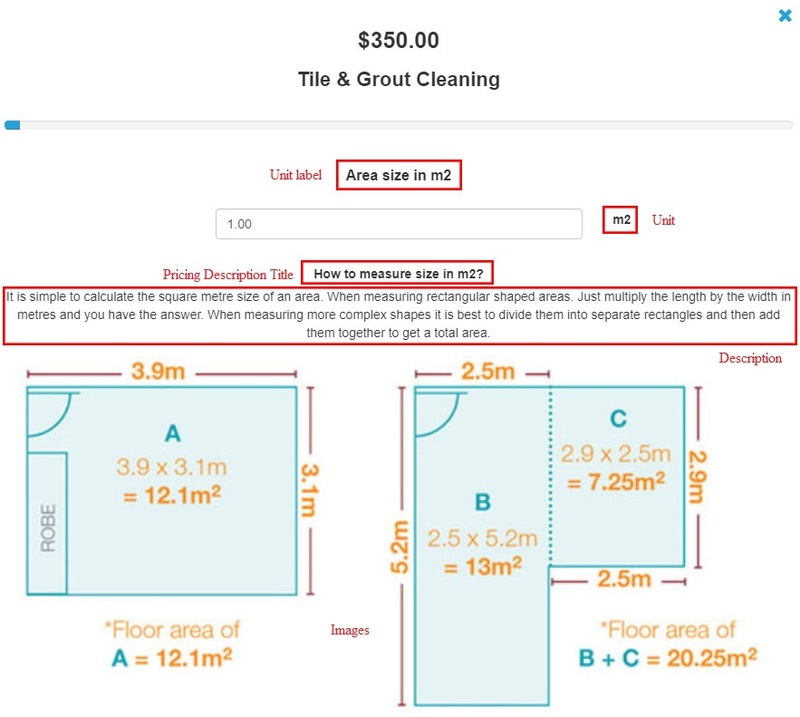 If your unit pricing is complex and you want to give instructions for your customers to help them calculate their area size and come to the final cost, you can fill in Pricing Description Title and Description. You can add images, too. These titles (Unit label, Unit, Pricing Description Title, Description, and the images) will be shown for your customers in customer portal. Then you can fill in the rates section. If you want to show your customers special offers, you can use rates. You can use rates if you want to charge your customers less or more than the default price of your service according to special orders that you offer. For example, If you choose the duration of your new service to be hourly and the default value is 100$ for the hour; and you want to make a discount for those who book this service for more than 10 hours, you can make the hour with 90$ by making a new rate. To create rates, click create a new rate. Then fill in the Rate field with the new default value that you want for this rate. And set the rate duration in Minimum booking time and Maximum booking time fields. For example, bookings from 10 hours to 20 hours can have a special offer so the default value of the one hour will be 90$ instead of 100$. Then you have to fill the Rate field with 90 and the Minimum booking time with 10 and Maximum booking time with 20. You can add as many rates as you want. When making a new booking and choosing the time duration of the service to be more than 10 and less than 20 , the system will notify you if you want to apply the rate price or keep the current default price of the service. Firstly, it will appear for you the default price of the service and a note under the price to show the suggested price according to the rate as shown in the screen shot: Suggested: 90. When pressing Calculate price, a popup question will appear for you to ask you if you want to apply the rate price or keep the default service price. If you choose Apply recommended, then the rate price will be taken as a cost of this service. To create rates, click create a new rate. You can create different rates for any service you add. Three fields have to be entered. In the Title field, write the name of your rate. In the Cost field, write the cost of your rate. In the Average duration field, write the duration of your rate. For example, if you are offering services to maintain cars and you added a service of painting cars by 100$, for example, but you want to charge your customers 130$ if it is a small truck. You can create a new rate for this service (painting cars) to explain all your different offers. You can add painting a small truck as a new rate with its cost. When making a booking and choose painting cars service, the service price (which is 100) will be applied for you if you don’t use any rate. But if you choose small truck from Select rate drop down, then the price of that rate will be applied (which is 130). You can also add discount offers if you want for the service. For example, you can make a new rate for painting two cars with 180$ instead of 200$. Creating new rates here is exactly like creating rates when charging by time. You have to fill in a new cost per unit for this rate in the field Cost per unit, fill in the Minimum unit and Maximum unit fields, and the Average duration per unit. For example, if you add a service of tile cleaning and you clean the 1 meter of tiles by 10$. You can make offers for this service. For example, you can create a new rate for customers who want to clean from 100 to 300 meters. If the customer make a booking to clean more than 100 meters and less than 300 meters, the cost of the one meter will be 8$ ,for example. So when making a new booking, selecting tile cleaning service and entering the units to be cleaned between 100 and 300, the unit price that will be applied is 8 instead of 10. After finishing creating your rates, you will come across Set service cost zone. If a service is priced differently in other locations, you can create zones and add a price to each zone for a specific service, so that the correct price for a service is applied when the location is selected. To do so, click Manage zones. Write the Zone Name, select the State/Province, and add the Unit Price for this service in this location. 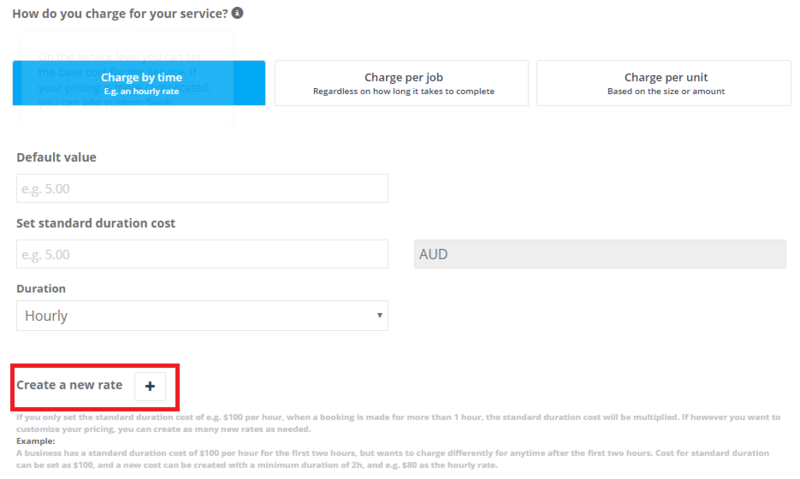 For example, if you are adding a new service and the unit price of this service is 10$ for the hour; and you want it to be 13$ for the hour in Sydney city in Australia, you can create new zone for this service adding Sydney city and the new unit price which is 13$. Then when making a new booking and choosing Sydney as the booking address, then the unit price that will be considered is 13 not 10. 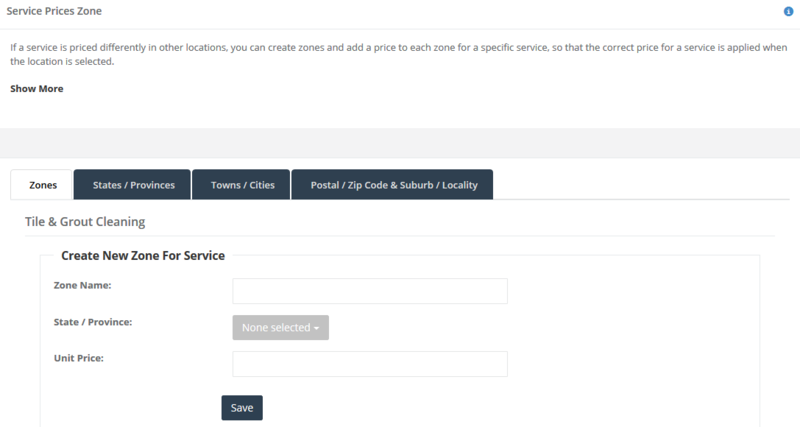 You can also set service cost zones from services page that contains the list of all your services. To do so, go to Settings>Services Settings>Services; then click Price Zones under the service you want to add a price zone to. You can add discount ranges to your services, but you cannot add discounts for your services if these services are charged per job. You can only add discounts if the services are charged by time or per unit. When these units come to a specific range, you can add a discount to be applied to that range. For example, if you are a baby siting company and you are charging the one hour of a specific service by 10$, you can make a discount if the range of hours reaches 10 to 20 hours. So you can set the Quantity from and Up to to be from 10 to 20 hours. Then write the discount to be applied to that range in Discount . Three types of discounts are shown for you: (per hour, one off, and percent). If you choose per hour, you can set the Discount field to be 1. It means that If the customer chooses a number of hours between 10 and 20 then a discount of 1 dollar per hour will be applied. So the one hour price will be 9$ instead of 10; and the 10 hours will cost the customer 90$ instead of 100$. If you choose the type of discount to be one off, you can set the Discount field to be 10, which means 10$. If the customer chooses a number of hours between 10 and 20 then a discount of 10 dollars will be applied. That is the 10$ will be discounted from the price of 10 hours, so the 10 hours will cost 90$ instead of 100 and if the customer booked 20 hours, then 10$ will be discounted from the price of 20 hours. If you choose percent, you can set the Discount field to be 10, which means 10%. If the customer chooses a number of hours between 10 and 20 then a discount of 10% will be applied. That is the 10% will be discounted from the price of 10 hours and if the customer booked 20 hours, then 10% will be discounted from the price of 20 hours. So, when making a booking, and choose to book from 10 to 20 hours of that service, then the discount will be applied to the service price. 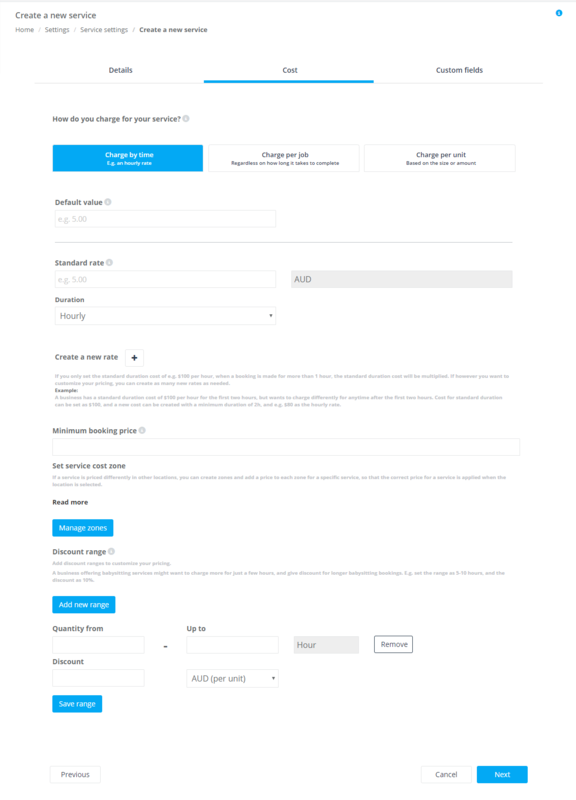 You can also set a discount range to a service from services page that contains the list of all your services. To do so, go to Settings>Services Settings>Services; then click Discounts under the service you want to add a discount range to. When adding a new service, you must decide how do you want to pay your fieldworkers for providing this specific service: hourly, or commission. Use “hourly” for fieldworkers that get paid an hourly rate for the services regardless of the amount invoiced for the service. 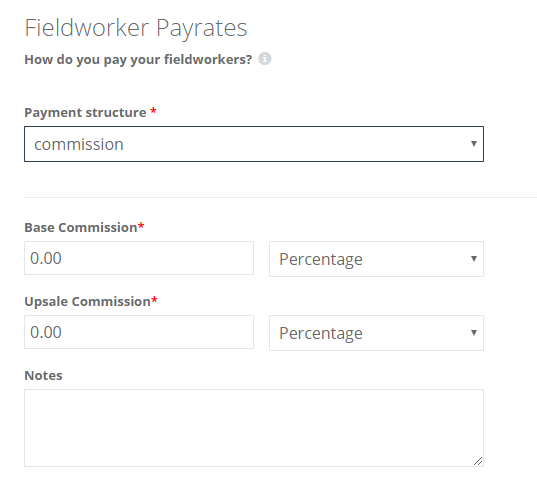 Use “commission” for fieldworkers that get paid a commission based on the total amount invoiced for the service. Hourly Rate: it is the amount of money you want to pay the fieldworker for performing this service in the hour. For example, you can set $20 an hour, so if the service takes 2 hours, they take $40, regardless of how much the customer is being charged. Over Time Rate: it is the amount of money you want to pay the fieldworker for working overtime. 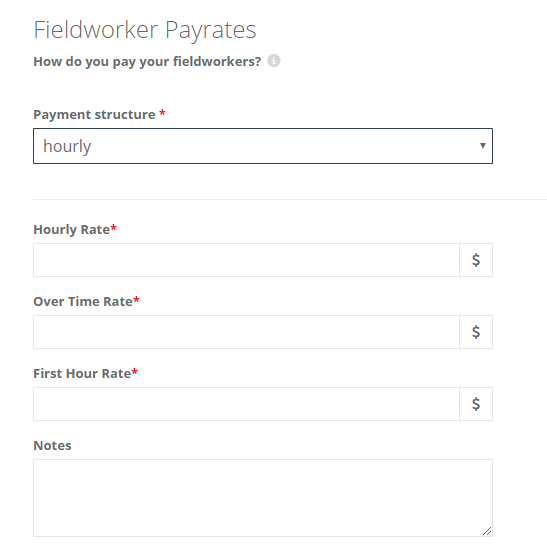 E.g, you can set it to be 25$ an hour, or you can set it as the default rate in “Hourly Rate” field if you don’t want to pay your fieldworkers extra money for their overtime jobs or if you don’t charge your fieldworkers overtime jobs. First Hour Rate: it is the amount of money you want to pay the fieldworker for the first hour of this service. This is only required if you pay your fieldworkers a different rate for the first hour and another rate for the remainder time. 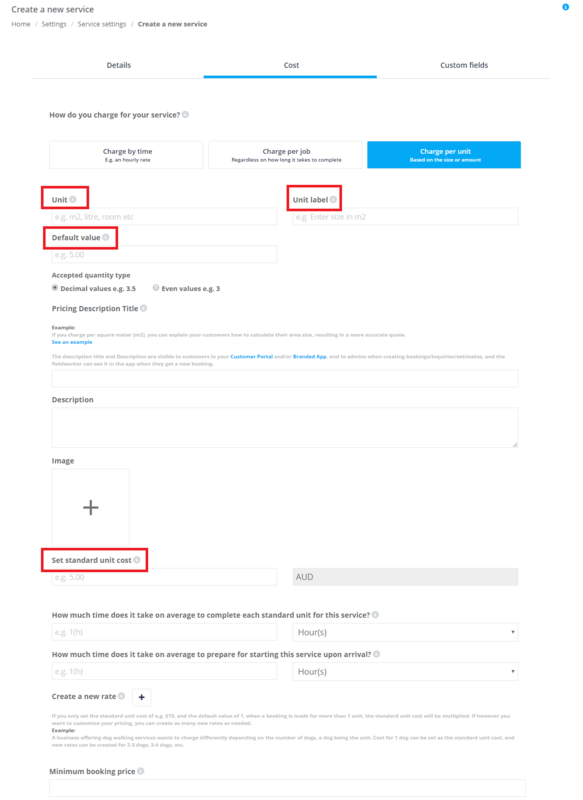 First hour rate only needs to be set if the first hour is paid differently to the rest of the hours, otherwise it’s you can set it as the default rate in “Hourly Rate” field. Notes: you can add extra explanation or details about your fieldworkers’ pay rates if needed. Base Commission: it is the commission rate you want to pay your fieldworkers for services booked for them, this can be a percentage or a flat rate. Flat rate is used for fieldworkers that get paid a flat rate for services regardless of the amount invoiced for the service. It is the set amount you want to pay the fieldworkers for performing this service, like e.g. $20, so it doesn’t matter how much the service cost is, they still get $20, whether the service is for $0 or $100. Percentage: like, e.g. 50% , so if the service cost is $100, they get $50. Upsale Commission: it is the commission your fieldworkers get paid if they upsell services on top of what was initially booked for them (when fieldworkers add extra services to the booking). This can be a percentage or a flat rate, too. 10. In Custom fields tab, you can add custom fields to be assigned to this new service. Click Add new, then choose whether you want to create a new custom fields or add an existing one. When making a new booking and choose a specific service, all custom fields assigned to this service will appear for the user to answer. If one of the custom fields affects the service price, the additional cost will appear for the user. 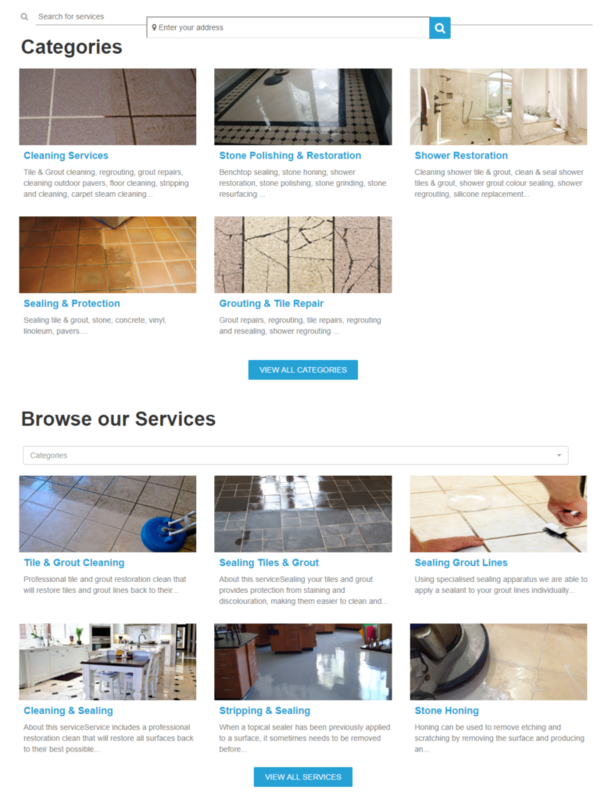 Here, choosing Tile & Grout Cleaning service will show you the five custom fields assigned to that service as shown. Some values of the custom fields can affect the service price like choosing Efflorescence Removal will cost the customer an extra 3$ per m2.